Bonsai, which translates to ‘tray planting’, originated in Japan at least a thousand years ago. Yet, such miniature trees were seen outside of Japan for the first time only as recently as 1909 at a London exhibition because for centuries before they were luxury items confined to the homes of wealthy Japanese aristocrats. Here we will uncover this ancient Japanese art form by exploring the different bonsai tree types and styles. Also, we will answer commonly asked questions a newcomer might have. 2.1: What is a bonsai? 2.4: How long does it take to grow? 2.5: How much do bonsai trees cost? 2.6: Can any tree be a bonsai? 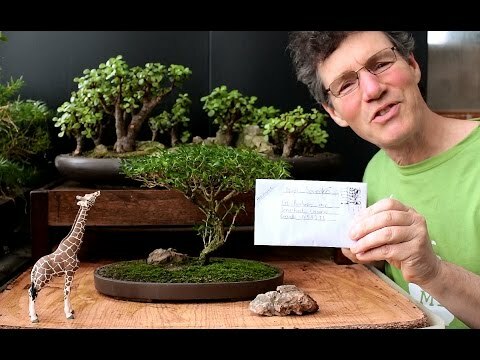 In this educational video Nigel Saunders shows us how to start an acacia bonsai from seed. The footage is owned and created by Nigel Saunders from The Bonsai Zone. All elements of Japanese culture carries meaning and bonsai trees are no different. In Zen Buddhism, monks view these miniature trees as a symbol of peace between both man and nature. Another meaning is balance and simplicity because everything about these trees have to be aesthetically balanced while maintaining simplicity. In the early days of bonsais they meant wealth because as previously mentioned they served as decorations in the homes of aristocrats. Here we have compiled a list of most frequently asked questions a newcomer to the world of bonsai might have. Click on any of the questions below to expand the box. Bonsai is the art of shaping and limiting a trees growth by keeping it between 20 centimeters and 4 feet in height. This is accomplished by limiting the use of fertilizer, pinching buds, wiring branches, pruning and by growing the tree in a shallow pot. How to grow a bonsai tree? Growing a bonsai from seed requires a lot of work, patience and a considerable amount of skill. Don’t be discouraged if you are a beginner because doing it this way is an excellent learning experience. A better way for an impatient beginner to learn is by purchasing and working on an already established tree. To learn how to grow a bonsai from seed simply watch the educational video from Nigel Saunders above. How to care for a bonsai? Taking care of a bonsai tree takes skill which can be learned through practice as well as trial and error. In addition, you will most definitely need a good quality set of tools. The type of care required will to some extent depend on the type and species of tree. But in general, things such as correctly watering, repotting, pruning and fertilizing all fall under basic maintenance and care. If growing from seed it will generally take at least 3 years before you have a tree you can actually begin working on. It will also take approximately 10 to 15 years for it to reach sufficient maturity to enter exhibitions and competitions. In other words – a lot of patience is required. There are, however, ways to make a tree grow faster by using grow lights and nutrient rich soil. How much do bonsai trees cost? Factors such as the species and height, as well as the amount of skill and effort that went into the tree are all things to consider when it comes to pricing a bonsai. They are for sale at many garden centers in Western countries for $20 or less. Older and rarer trees, however, can cost up to hundreds to many thousands of dollars. The most expensive one ever sold was a centuries old pine that fetched for $1,300,000! There are also trees which are near a thousand years old that are considered to be priceless. Can any tree be a bonsai? Generally, any tree that can blossom has the potential become a bonsai. There are literally hundreds of compatible types and new ones being discovered on a regular basis that can easily be converted. Check out our list of the most popular types in the section below. Choosing a suitable tree type is essential for the beginner hobbyist. This is important because different types of bonsai have different needs and no two varieties are the same. And although there are many varieties with new ones being introduced on a regular basis we will only list some of the most popular ones. The juniper is part of the cypress family and consists of around 50 to 70 species. It’s also one of the most popular entry level trees thanks to it being easy to shape and train. It’s important to remember that the juniper is an actual tree and not a houseplant therefore it needs to be treated for diseases and insects if the need arises. Additionally, it will prosper in just about any environment as long as it has sufficient humidity and light – whether you keep it indoors or outdoors. The cotoneaster is unique and a favorite among many bonsai enthusiasts. They originally hail from Europe and Asia, and depending on the species – may seasonally produce tiny non-edible toxic berries or beautiful white flowers. Just like the juniper, the cotoneaster is a popular beginners tree. It’s best to keep it in direct sunlight throughout the day. Keeping it outside at night is okay but it needs to be protected if temperatures drop below 23F. Keep in mind, the cotoneaster dies quickly and oftentimes unexpectedly if neglected for long periods but can become very tough and durable when following the correct basic care techniques. An azalea bonsai on display. The azalea, also known as a rhododendron, consists of about 1,000 different species. Out of the hundreds of species only two stand out as being perfect bonsai candidates – satsuki and kurume. It’s loved for its exceptionally fast growth rate and breathtakingly beautiful flowers. The only downsides to using the azalea is that the bark is fragile and branches break easily. This means that great care needs to be taken when shaping branches with wiring. Pine’s are probably the most popular types of bonsai, especially in Japan because of their abundance. The most common species used are the black, red and white pine and each requires more or less the same type of care. These trees are known for being strong and fairly resistant to diseases which makes it the perfect tree for beginners. Not only that but they also really do look spectacular. Pines prefer colder climates but they can grow in warmer regions as long as extra attention is given to them. The tropical bougainvillea is from South America, produces vibrantly colorful flowers and makes a great bonsai tree. It loves warm summer weather and lots of sunlight but needs to be protected during the cold winter months. It also features a strong natural resistance to pests and disease but may be susceptible to fungal infections. To avoid these infections monitor the humidity levels and regularly use a fungal spray. The fig bonsai, also known as the ficus, is an easy tree for beginners. It can flourish indoors, give off figs and can be easily shaped into many different forms. What more could you possibly want? If you choose the ficus as your first bonsai tree you will be delighted to know that there are literally hundreds of species to choose from. Also, they prefer warm humid environments with lots of sunshine. The dwarf jade comes from the driest regions of Southern Africa and is oftentimes referred to as the Elephant Bush. It has the ability to soak up and store water for long periods which helps it survive in extremely dry climates – which also means it doesn’t need constant, or even regular care. As a matter of fact, watering your dwarf jade bonsai tree once every 6 to 8 weeks is perfectly fine. It has thick green leaves and beautiful pink flowers. The bark also has a strange green tint while its young, only to turn to a reddish-brown color as it grows older. Shaping the branches is easy which makes it ideal the ideal tree for beginners. Olive trees originate from the Mediterranean and are known for their strength as well as durability. The olive bonsai tree grows fast and that is good news for an impatient horticulturist who is growing the tree from seed. Needless to say, they thrive in warm humid conditions but not so much in colder climates. If conditions outside gets too cold it will be best to bring the tree inside even though they really do not die easily. Styling is important because aesthetics plays a vital part in the art of bonsai. There are many styles and shapes a miniature tree can be transformed into but the 5 main styles are – semi-cascade, full cascade, slanting, formal upright and informal upright. We will also cover the super miniature shohin style. The full cascade style, or kengai as the Japanese call it, is when a tree grows downward instead of the conventional upwards direction. This particular style is pretty common in the natural world, especially when growing on cliff sides. It happens because of falling rocks or from the weight of snow which piles up. Artificially creating this shape requires some patience and skill. The type of pot plays a crucial role for achieving the full cascade shape. For this you will need a tall pot to prevent the tree from toppling over. At first you will have to allow it to grow upwards until it reaches sufficient height before starting to bend the trunk downward through means of wiring and bending techniques. The apex point should reach just below the base of the pot while the branches extend out in a horizontal position. The semi-cascade style is very similar to the full cascade and the only real difference is that the tree doesn’t run straight down. Instead it runs down at about a 45 degree angle while the tip of the apex extends to just below the lip of the pot. The slanting style, much like the two aforementioned cascading styles, can be found naturally. A tree will slant as either a result of strong wind blowing from one particular direction over time or it occurs when a tree grows in the shade and has to slant itself in order to get some sun. Recreating this effect is not as tricky as the two cascade styles. The tree should be slanting at a 60 to 80 degree angle and the roots need to be well developed on one side to prevent the tree from toppling over. In addition, the base of the trunk should be the thickest while gradually narrowing the higher it goes. The formal upright is not only the most common style but also the easiest to create. The base is the thickest part and gradually becomes narrower the higher it goes. The branches should only start from a quarter of the way up. The informal upright, or Moyogi as its known in Japan, is very commonly found in nature. It’s basically identical to the formal upright (chokkan) style with the exception that the trunk has an S shape as opposed to the conventional straight trunk. The super miniature shohin style is very unique indeed. Although there is no size classification, many experts tend to agree that for a bonsai to be classified as a shonin it should not exceed 20 centimeters in height. In other words, these trees can easily be held in the palm of your hand. Such trees are aesthetically beautiful but the smaller they get, the less detail they tend to have. Interestingly, the actual word shohin translates to tiny thing. Creating a shohin from seed also takes more patience than a regular bonsai tree would require because it takes approximately 5 years to get a tree down to that size. The type and style of pot plays a major role because of aesthetics and its one of the most overlooked aspects among Western hobbyists. The Japanese see the pot as being the equivalent of a picture frame. Everything from the color and shape of the pot used will depend on the shape and size of the bonsai. For example, trees in the slanted and cascade styles are best placed in rounded pots while formal and informal upright trees are best suited for rectangular pots. In addition, trees with thick trunks appear best in deep pots while shallow pots are ideal for those with thin trunks. The actual color of the bonsai pot also matters significantly. Trees featuring colorful flowers, fruits or bright foliage look their best in glazed green pots. Those with dark green leafs are ideally placed in neutral colored unglazed pots such as red, brown or grey. The soil in Japan is pretty much the same as in other parts of the world that has a temperate climate. It’s important to keep in mind that when collecting soil for your bonsai one should never scoop it up from the surface. Instead, use soil from 3 feet down or deeper. This is to prevent using soil which has become contaminated with harmful insects and other contaminants. The soil collected cannot be used straight away. First spread it out in the sun for a week before sieving and using. Alternatively, you could purchase specially prepared bonsai soil mix which is good to go. Moss does not aid with growth but it does serve multiple purposes. Firstly, its great for aesthetic purposes, especially with those featured at bonsai exhibitions. Secondly, it prevents birds from scratching around in the soil in search of insects. Lastly and most importantly, it helps keep the soil hydrated. Adding moss to your tree is really simple. Just collect it from wherever you can find it such as from roof tiles or tree bark, crush it up into fine pieces and sprinkle it around the base of your tree. Spray water in mist format directly on top and within a few weeks the moss should start growing naturally. A list of all tools you could possibly need to start your bonsai hobby..
Take a look at the most beautiful trees at these exhibitions in Japan..
Now that you know more about the art of bonsai, why not learn the necessary skills via video from a well experienced expert? Check out the YouTube page of Nigel Saunders. Knowing how to take care of a bonsai is the most crucial part of the craft. Learn the basics of watering, pruning and shaping at ftd.com. There are many types and species of tree that can be converted to a bonsai. Choosing the right one is important and oftentimes dependent on your success. Take a look at Wikipedia’s list of compatible tree types here.